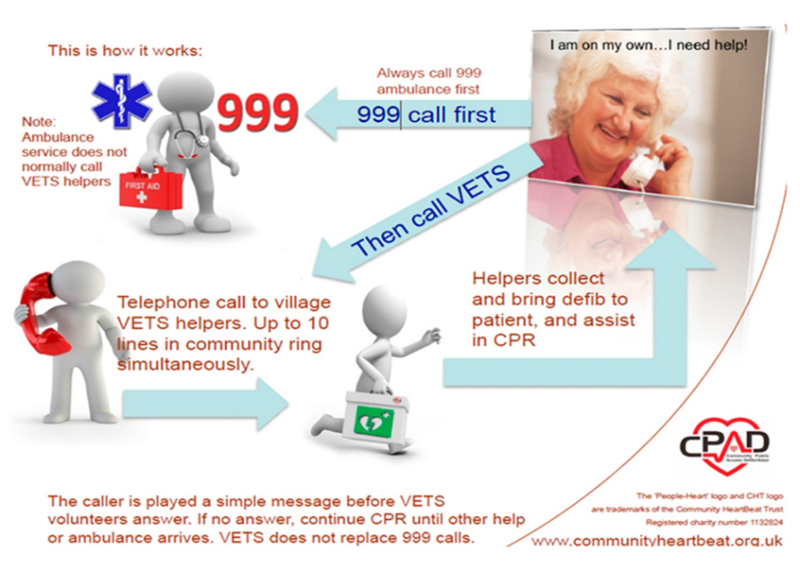 The system has been developed to provide a single emergency telephone number that anyone in the village can ring for help in case of emergency, having first dialled 999 to call the emergency services. Often in cases of emergency, further assistance or support is required whilst waiting for the emergency services to arrive. This could be someone to fetch the defibrillator or someone to provide practical or emotional support. When the VETS number 01539 234911 is dialled, the phone will ring simultaneously in 10 households in the village. It is likely that one of the ten will be able answer and respond to the request for emergency help. Brigsteer has ten volunteers, any one of whom may respond when the VETS number is dialled. There is no guarantee that the VETS call will be answered. VETS is a ‘best endeavours’ system. Although the volunteers will have received training for the VETS system, they are not connected to, or a replacement for, the ‘First Responder’ system which is run by the ambulance service. In an emergency it is important that ‘999’ is called first. Our community public access defibrillator is situated at the Wheatsheaf.